She blinked her sun-dazzled eyes, surprised to see that, though the roses didn’t sing, they changed color. Pink roses twisted their petals, soaking in the afternoon sun. Red begonias and calla lilies decorated the edges of the rose beds. And, Carly, a white-faced calico sunned herself in the grass, enjoying the subtle scent of mint, rosemary, and catnip that drifted to her on the gentle wind. Carly had been a witch’s cat but no longer; the garden had been the witch’s garden but without her tender ministrations would soon fall to weeds, bracken, and brambles. Carly and the roses were orphaned when their kitchen witch disappeared. Neither cat nor roses knew the complex dramas of human life that could force a woman who loved them to leave. They didn’t know why she had gone, only that she had. “Well, roses, it’s just us now,” Carly meowed, alone in the garden. “The door doesn’t open anymore.” There were no loving hands to pet her. Carly looked through the windows, but the kitchen witch’s house stayed resolutely dark inside. Carly used to sit on the kitchen witch’s lap and sing her songs about fish. She had slept on soft pillows. Now she slept on the grass outside and sang to the roses. Carly learned to roam the neighborhood, stealing food from other cats’ bowls and gaining scritches, when she missed them, from other cats’ owners. Though, they weren’t the same as her witch’s caresses. It was a wet summer, and the roses grew wild without the taming touch of the kitchen witch’s clippers. As the garden grew wild, so did Carly’s heart. “Roses, sing with me!” Carly sang, one day when the sun beat down on her fur, making her black splotches burn with heat and the pupils in her golden eyes narrow to the merest slits. She blinked her sun-dazzled eyes, surprised to see that, though the roses didn’t sing, they changed color. They’d always been pink roses before. Now the blooms blushed red, orange, yellow, and violet. There were even blossoms of electric blue and crinkly white like old lace. Carly smiled at the roses with her golden eyes. “You sing with colors.” She sang with purrs, deep in her throat. A year passed, and the For Sale sign on the house never moved. Carly grew used to her new feral nature, but she never forgot that she used to be a witch’s cat and never stopped visiting the kitchen witch’s garden to sleep in the grass and sing to the roses. Her life was different, but she didn’t change. The roses, however, changed every time she visited them. Often their colors shifted like the rainbow sheen on an oil-slicked puddle. Sometimes they were shaped like fish. Once they jumped off of the bushes and ran around the grass like little fairies. Then, one day, everything seemed normal. Carly sat in the middle of the overgrown, brittle and brown grass of the lawn; she twisted her ears about, disturbed and trying to understand how her magical garden had become as pedestrian as every other yard she visited. “Why don’t you sing?” she cried to the roses. She didn’t care if they sang with their colors or their shapes or by twirling about the lawn around her, but she couldn’t stand them staring at her like dead eyes. The pink roses, void of life and animation, became mere plants that had never belonged to a witch. Droplets of rain, small and erratic, tickled at Carly’s whiskers; her back twitched at their touch. The droplets grew larger, heavier, and steadier. Carly crept under one of the rose bushes, thick and tangled from a year without pruning, to hide from the rain. She watched the water drench the parched ground and thought about all the comfortable hideouts throughout the neighborhood where she’d be better protected from the growing storm. The woodpile behind the green house was always dry; the yellow house had a roaring machine behind it that vented warm air; and the children’s playhouse behind the gray house had a comfortable child-sized chair to sleep on. But Carly couldn’t leave the witch’s garden. Without the roses, she felt severed from the glimmer in her heart that knew she was a witch’s cat. She wasn’t any old stray. She was a witch’s cat, and this was a witch’s garden. That magic could not whither away. She wouldn’t let it. Nimbus clouds darkened the sky, and rain roared against the leaves shielding Carly. Water dripped and drizzled down between the vines, wetting her fur, but Carly sang to her roses, begging them to bring their magic back to her. Her soft purring song was drowned out by the storm. Morning came, and Carly’s heart broke with the breaking of the clouds. Golden light graced the horizon, but the light in Carly’s golden eyes dimmed. She had imagined it all. She realized that now. The roses didn’t dance and sing. There had probably never been a kitchen witch. She was a lonely stray, and that was all she had ever been. “I’m ready to sing with you now.” The voice vibrated in the very vines around Carly. She twisted her head about, turning her ears every direction, looking for the source, but she saw nothing. Only overgrown rose vines, thick with thorns and leaves. “Who are you?” Carly meowed. “I’m your roses.” The voice sounded closer. As Carly stared into the vines, her eyes made out shapes — the curve of a muzzle, the straight line of whiskers. She blinked, but the vision only became clearer. A cat’s face, drawn in rose vine with pink blossoms for eyes, stared down at her, smiling. Carly cried out in joy, and her cry turned into the meowly growl of her favorite fish song. The ethereal cat face drawn in rose vines sang with her, and their duet was as sweet as morning dew on pink petals. “You’ve never talked to me before,” Carly said when the song was over. “You’ve never needed me to,” the rose vine cat answered, his muzzle distorting and twisting the rose bush as it moved. Carly and the rose vine cat talked together for hours. She told him about the other cats and gardens in the neighborhood — she mostly didn’t like the cats, and the gardens trended towards utilitarian plants like squash, zucchini, and tomatoes. Carly loved the yard that grew catnip but otherwise felt the gardens lacked beauty. Then they reminisced together about their kitchen witch. At night, their witch had lit candles around her house, and the roses had seen them twinkle in the windows like stars on Earth. During the day, she had drawn patterns on the grass, sprinkling a special dust mixed from oatmeal and Italian spices. She’d drawn stars and circles, and she sat inside them, cross-legged and sang songs. Her songs weren’t about fish but trees and gods and meadows and the sky. Silly songs that made no sense to roses or cats. Carly missed them anyway. The rose vine cat wouldn’t answer, but Carly had to leave anyway. Her stomach commanded it. From then on, Carly never knew what form to expect the rose vine to take when she visited. Some days, it was a normal rose vine; other days it sang with her as before; but, on the best days, the vines shaped themselves into the likeness of a cat and talked to her. She hadn’t known how lonely she’d become until the rose vine cat’s company relieved her. The answer made Carly sad, but it didn’t surprise her. She was surprised, however, when the For Sale sign — so long in front of the kitchen witch’s house — disappeared. She sniffed the rectangular hole in the ground where its wooden stake had stood for more than a year. Moist, bare soil like a wound in the Earth housed a single, wriggling worm. If it was an hallucination, it was a very good one. Instead of jumping the fence and returning to her rose garden, Carly sat on the front drive and stared at the house. She imagined the windows lit again. She imagined people — different people than her kitchen witch — living inside. Her imaginings filled her with trepidation. Would they cut back her roses? Would they tear out the precious bushes and plant horrible squash or pumpkins? Carly didn’t want to sing to pumpkins or zucchini. She loved her roses. Carly leapt over the eight-foot-tall fence, returning to her secret, overgrown garden of roses. The bushes had strong stems with twisting vines, but the leaves were sparser now that autumn kissed the air. Only two pink blossoms, past their prime and sloppy with petals ready to fall out, were left. “Oh, my love! Run away with me! The witch’s house has sold, and I don’t know what the new people will do with you when they move in.” The eight-foot-tall fence would no longer protect him. The pink blossoms shuddered and winked; at different heights, on adjacent but separate bushes tangled together, the blossoms made for a skewed, cockeyed face. Vines rearranged themselves, drunkenly forming into the smiling cat face that Carly so loved. The rose vine cat whispered comforting words to Carly, but all his words were words of uncertainty: they didn’t know if new people would move into the house; they didn’t know if people would cut back the rose bushes; they didn’t know. The words of comfort rose and fell in tone, found a tune, and became a song. As the rose vine cat sang to Carly, he wrapped her in vines and leaves, caressing and cradling her, carefully protecting her from any thorns. She felt like a flower in his vines. Her heart, body, and soul opened to him like a rose spreading its petals to the sun. She found comfort in him, and he found release in her. They were not a rose garden and a cat, separate beings, but a rose garden cat, a singular creature unto itself complete. Night came, and a gentle rain sprinkled the Earth like pinpricks of starlight sprinkled the breaks between the clouds in the sky. Carly awoke with the dawn, curled up on the hard dirt beneath her rose bush. No sign showed the magic that had taken place in the night, but Carly felt a change within her. A SOLD sign succeeded the For Sale sign. Within a matter of days, trucks came. Doors that had stood shut for a year flapped open, letting people who carried sofas and lamps, bookcases and computer desks, in and out all day long. The gate in the eight-foot-tall fence that had protected Carly’s rose garden swung wide, opening that secret place to the world. Human children — a toddling boy and a curly-haired girl who babbled at anyone who listened, human or not — invaded the private garden. The girl picked the last two roses, and gave one to her toddling brother, keeping the other for herself. Carly watched it all, perched safely out of reach on top of the fence. She didn’t mourn the roses. They would grow again. For months, Carly held herself separate from the new family that lived in her home, but she felt a growing fondness for the young girl. Skeptically, Carly watched the family fill the house’s windows with light — not candlelight like the witch’s but artificial — fluorescent, halogen, the blue glow of computer screens, and the red and green twinkling of LEDs. The most interesting light was the one that glowed under the covers in the little girl’s room at night and peeked out at the edges of her blanket when she disappeared underneath with a book. The kitchen witch had read books when she sat on her rocking chair; she’d never read them under blankets. Autumn deepened into winter. The rose bushes bore nothing but bare brambles, and Carly craved the warmth inside her witch’s house. She wanted to sleep on that glowing blanket and pounce on the shape that moved under it. Carly let the new family take her in. The toddling boy grabbed at Carly’s tail and whiskers; the curly-haired girl squeezed her around the middle, carried her from room to room, and dressed her in doll clothes. The girl didn’t let Carly sleep on her glowing blanket; she pulled the reluctant cat right underneath the covers with her. In spite of herself, Carly purred. All through the winter, Carly’s body grew thicker. She grew fat from the food her new family fed her, and her belly swelled with the pollen from her rose bush. She bore kittens in late December. When the adult humans who lived in her home tore out the rose bushes in the spring to plant a vegetable garden, Carly didn’t mourn. She had a new, young witch who brought magic to everything she saw. And she had her flowers — five kittens as perfect as roses. The adults may have seen perfectly ordinary kittens, but Carly and the girl knew better. 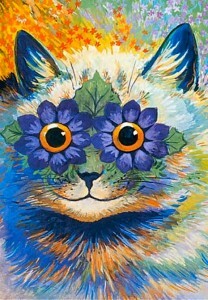 Carly saw dancing colors in her kittens’ eyes and sang them songs of fish and flowers.